Despite their wartime alliance, tensions between the Soviet Union and the United States and Great Britain intensified rapidly as the war came to a close and the leaders discussed what to do with Germany. Post-war negotiations took place at two conferences in 1945, one before the official end of the war, and one after. These conferences set the stage for the beginning of the Cold War and of a divided Europe. 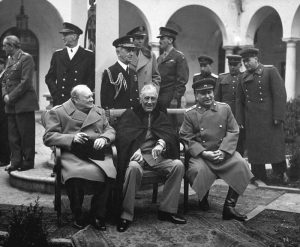 Churchill, Roosevelt and Stalin (left to right) at the Yalta Conference. In February 1945, when they were confident of an Allied victory, U.S. President Franklin D. Roosevelt, British Prime Minister Winston Churchill and Stalin met near Yalta, Crimea, to discuss the reorganization of post-WWII Europe. Each country’s leader had his own set of ideas for rebuilding and re-establishing order in the war-torn continent. Roosevelt wanted Soviet participation in the newly formed United Nations and immediate support from the Soviets in fighting the ongoing war in the Pacific against Japan. Churchill argued for free and fair elections leading to democratic regimes in Central and Eastern Europe, especially Poland. Stalin, on the other hand, wanted Soviet “sphere of influence” in Central and Eastern Europe, starting with Poland, in order to provide the Soviet Union with a geopolitical buffer zone between it and the western capitalist world. Clearly there were some key conflicting interests that needed to be addressed. Unconditional surrender of Nazi Germany, the division of Germany and Berlin into four occupational zones controlled by the United States, Great Britain, France and the Soviet Union. Germans, civilians and prisoners of wars, would be punished for the war (reparations) partially through forced labor to repair the damage they caused to their country and to others. Poland was reorganized under the communist Provisional Government of the Republic of Poland, and Stalin promised to allow free elections there (but failed to ever follow through on it). The Soviet Union agreed to participate in the United Nations with a guaranteed position as a permanent member of the Security Council. Stalin agreed to enter the Pacific War against Japan three months after the defeat of Germany. Soon after the conference it became clear that Stalin had no intension of holding up his end of negotiations. He eventually allowed for elections in Poland, but not before sending in Soviet troops to eliminate any and all opposition to the communist party in control of the provisional government. The 1947 “elections” solidified communist rule in Poland and its place as one of the first Soviet satellite states. As per its Yalta agreement, the Soviet Union was set to invade Japan on August 15. 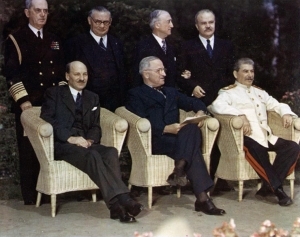 While the Potsdam declaration did not specifically mention the newly developed atomic bomb, Truman had mentioned a new powerful weapon to Stalin during the conference. The timing of the bombings, on August 6 and 9 suggest that Truman preferred to keep the Soviet Union out of the Pacific War and out of post-war dealings with Japan. Moreover, this show of nuclear prowess on the part of the United States was also a warning to the Soviet Union, and effectively ended either side’s desire to continue working together, and marked the start of the nuclear arms race that underscored geopolitical considerations of both the United States and the Soviet Union throughout the Cold War. 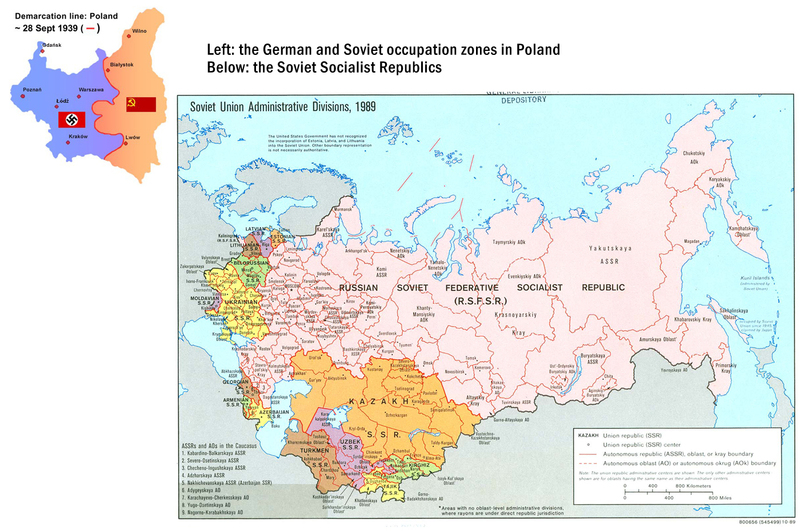 The Soviets annexed their first territories in eastern Poland on September 17, 1939, under the terms of the Non-Aggression Pact made with Nazi Germany. Soon after, the Red Army went to war with Finland in order to secure a buffer zone of protection for Leningrad (St. Petersburg). When the war was over, Finland ceded the territories demanded by the Soviets plus Karelia. 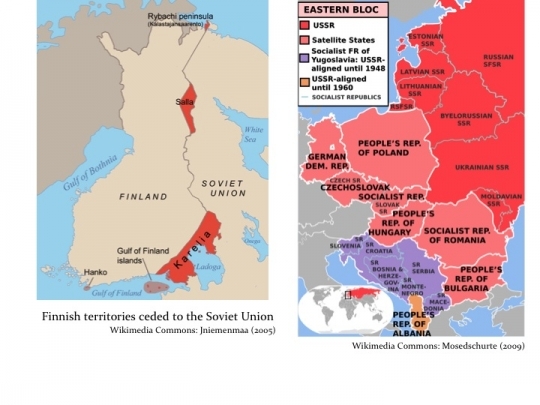 The Soviet Union subsequently annexed the Baltic States, Estonia, Latvia and Lithuania, as well as Moldova in 1940. Several other territories (modern-day Ukraine, Uzbekistan, Kazakhstan, Belarus, Azerbaijan, Georgia, Tajikistan, Kyrgyzstan, Turkmenistan and Armenia) had been annexed prior to 1939. In addition to the Republics, several countries in Eastern Europe operated as Soviet satellite states. These countries were not officially part of the USSR, but their governments were loyal Stalinists, and therefore looked to and aligned themselves with the Soviet Union politically and militarily via the Warsaw Pact. After the Potsdam conference, Germany was divided into four occupied zones: Great Britain in the northwest, France in the southwest, the United States in the south and the Soviet Union in the east. Berlin, the capital city situated in Soviet territory, was also divided into four occupied zones. Germany also lost territory east of the Oder and Neisse rivers, which fell under Polish control. About 15 million ethnic Germans living in this territory were forced to leave, suffering terrible conditions during their expulsion. Many froze or starved to death on over-crowded trains, while others were subject to forced labor camps under Polish and Czechoslovakian governments. West Germany, or the Federal Republic of Germany, was officially established in May 1949. East Germany, or the German Democratic Republic, was established in October 1949. Under their occupying governments, the two Germanys followed very different paths. West Germany was allied with the U.S., the U.K. and France and became a western capitalist country with a market economy. In contrast, East Germany was allied by the Soviet Union and fell under highly centralized communist rule. More information about the socioeconomic paths of the two Germanys, as well as those of Western and Eastern European countries can be found in later sections.